Delray Beach sees a large daily influx of people who visit it for work or relaxation. 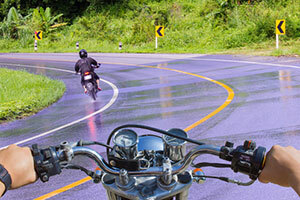 The year-round pleasant weather encourages the use of motorcycles by locals and tourists to commute to and from the city, hence the substantial number of motorcycle accidents. Did you know that around 10-15% of all motorcycle accidents deaths in the whole United States every year occur in Florida? It is a staggering statistic. Our bilingual Palm Beach injury lawyers have been helping injury victims obtain ffinancial compensation after injury-inflicting motorcycle accidents in Florida since 1963 and are at your service. Call us now at 855-982-2067 for free consultations. Delray Beach comes to mind when you think of the famous South Florida miles-long white-sand beaches. The city is popular among beachgoers, spring breakers, and adventure-seekers. It is a place where people go to enjoy life. Apart from the beaches, it hosts plenty of nightclubs, bars, restaurants, hotels, resorts, art galleries, and other entertainment places. Delray Beach belongs to the Palm Beach County and is part of the Miami metropolitan area. It is in the heart of Florida's Gold Coast region and borders with several cities and neighborhoods, including Boynton Beach, Boca Raton, and Highland Beach. On the western side, it shares boundary with several unincorporated communities and the Everglades. Around 67,000 people live there, but the city sees a daily influx of people who come there for work or relaxation. When you are injured in a motorcycle accident in Delray Beach or you've lost a loved one due to a wrongful death, you need sound legal advice before doing anything on your own. Insurance companies often offer injured victim a settlement, which looks like a quick way to get compensated for the suffered harms and losses, but it's rarely the right way. These offers are rarely what you really deserve. It is not always an amount of money you can rely on for covering all your injury-related expenses. That is why you need to call our Delray Beach motorcycle accident attorneys at the Wolfson Law Firm for assistance. We will help you determine if you have a persuasive case and the compensation you should claim. We will help you build a convincing case and stand by you until the very end. Call us now at 305-285-1115 for free consultations. We don't ask for any fees until and unless we recover for you.